The blue carpet is once again being rolled out for the 7th annual Kidney Gala, and for the first time in Gala history, the event will be held on a Friday evening! We are pleased to announce that our guests of honour and keynote speakers are Toby and Bernadine Boulet, parents of Logan Boulet. Sadly and tragically, Logan was a victim of the Humboldt Broncos bus crash last April. Prior to this tragic event, Logan expressed his wishes to be an organ donor. As a result, Logan not only gave life to six individuals needing an organ transplant, but he has inspired a nation, with OVER 100,000 Canadians registering their organ donation wishes after his story went viral on the internet, resulting in the #LoganBouletEffect. Emcee'd by Vancouver's "Man About Town", Fred Lee, and Sophie Lui, Anchor, Global News, join us on Friday, March 8, 2019, at the JW Marriott Parq Vancouver to honour Logan and his family and to continue to spread awareness around organ donation. The JW Marriott Parq Vancouver has offered exclusive discounted rates for our guests. There are only a limited number of rooms available, so book NOW! Click here for more info. Click HERE for more info on the After Party. *Times subject to change. Stay tuned for more details! Click here to purchase tickets. Ticket sales close March 7th at 8:00pm. A tax receipt for a portion of the event ticket will be mailed after the event. Click here to read our Tax Receipting Policy. To fund and stimulate innovative research; provide education and support to kidney patients and high risk groups; promote access to high quality healthcare; and increase public awareness and commitment to advancing kidney health and organ donation. Members of the business and philanthropic communities, medical professionals, their patients and supporters in celebration of the people and possibilities within BC's renal community. Kidney disease is a very serious disease that is under-recognized and incurable. One in ten British Columbians are affected by this disease, with high blood pressure and diabetes as leading risk factors. 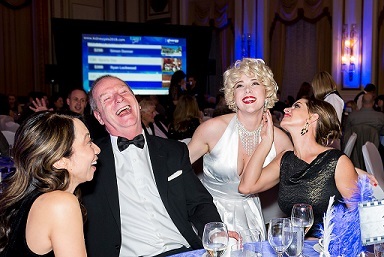 living kidney donor, enjoying some fun with "Marilyn"! Photos will be taken during the evening and may be used by The Kidney Foundation of Canada to showcase the event. If you do not wish for your photo to be taken, please inform the photographers during our event. The Kidney Foundation of Canada, BC & Yukon Branch is part of the national organization that is committed to kidney health and improved lives for all people affected by kidney disease. Our mission is to fund and stimulate innovative research; provide education and support; promote access to high quality healthcare; and increase public awareness and commitment to advancing kidney health and organ donation. The Canadian Society of Nephrology is a society of physicians and scientists specializing in the care of people with kidney disease, and in research related to the kidney and kidney disease.